Ultrabook update. 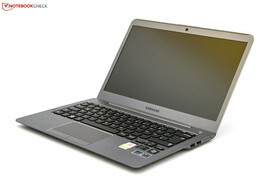 We reviewed the Samsung Series 5 530U3B-A01DE in mid-March 2012. The ultrabook has now been revised to feature an Intel Ivy Bridge dual-core processor. Virtually everything else, including the manufacturer’s suggested retail price (MSRP) of 799 Euro ($999 USD), remains unchanged. In this review, we will examine exactly what has changed and who would benefit from the revision. 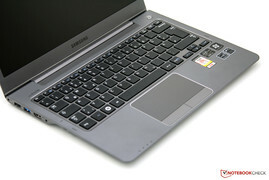 Building on the previous success of the 530U3B-A01DE ultrabook, Samsung has updated the line to feature the third generation of mobile Intel Core processors. These processors, under the code name Ivy Bridge, feature the more powerful integrated Intel HD Graphics 4000 as the onboard GPU. 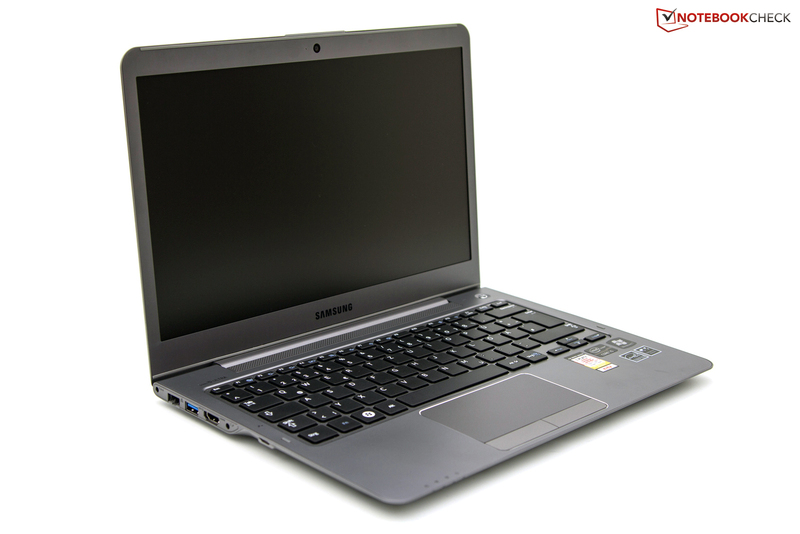 The newly updated Samsung Series 5 530U3C-A01DE reuses the case of the previous model without any modification. As a result, we refer the reader to the previous model’s review for our analysis of the case, connectivity, and input devices. In contrast to the change of processor, most other physical features of the ultrabook remain the same. The WXGA (1366x768) matte 13.3-inch display, thickness of approximately 18 millimeters (0.71 inches), and low manufacturer’s suggested retail price (MSRP) of 799 Euro ($999 USD) have been carried over from the predecessor. The ultrabook continues to use the 500 GB physical hard disk but the SSD Express Cache has been expanded from 16 GB to 24 GB. Starting in April, Samsung also offers the 530U3C-A01DE ultrabook in pink and brown as options instead of the standard silver (light titanium) model. The more colorful models carry an MSRP of 899 Euro ($1119 USD). 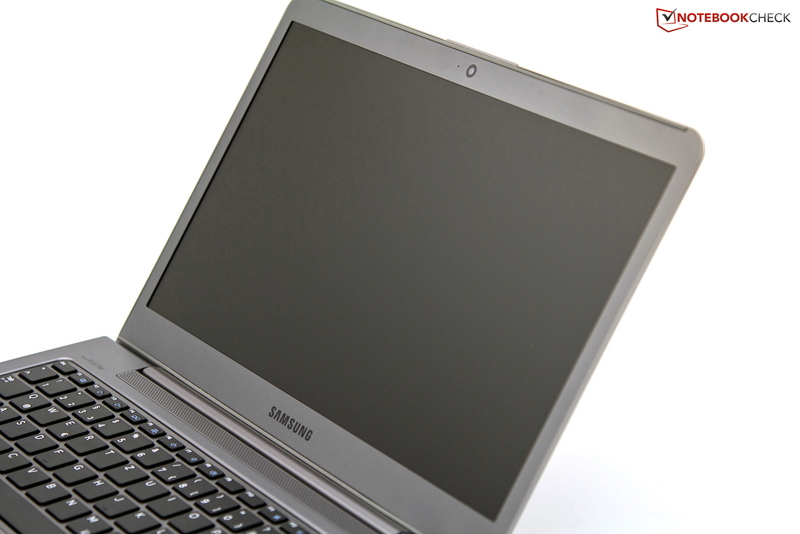 The 530U3C completely reuses the case of the preceding of Samsung Series 5 530U3B-A01DE. As a result, the criticism regarding the previous model’s stability and rigidity also apply to the current 530U3C. Samsung reuses the previous case. Stability and rigidity remain points of criticism. 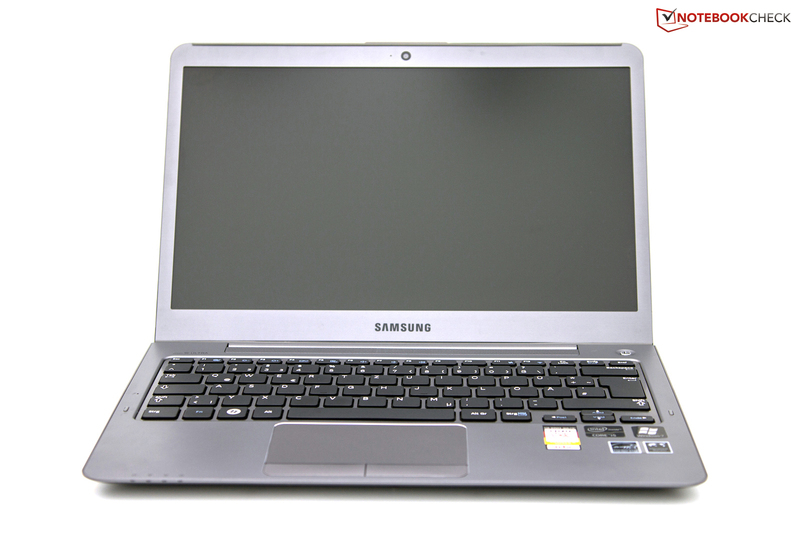 Connectivity in the 530U3C-A01DE remains identical to the options of the Samsung Series 5 530U3B-A01DE. 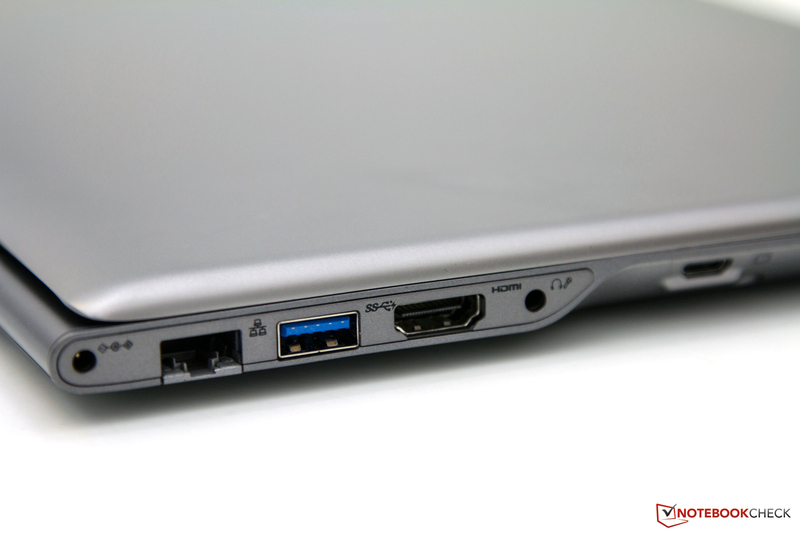 The 530U3C retains the USB 3.0 port and HDMI and VGA outputs for external monitors. The matching VGA adapter is no longer included and must be purchased separately. More information on the connectivity options can be found in the review of the previous model. Samsung chose to upgrade communication options in the 530U3C-A01DE to current standards. 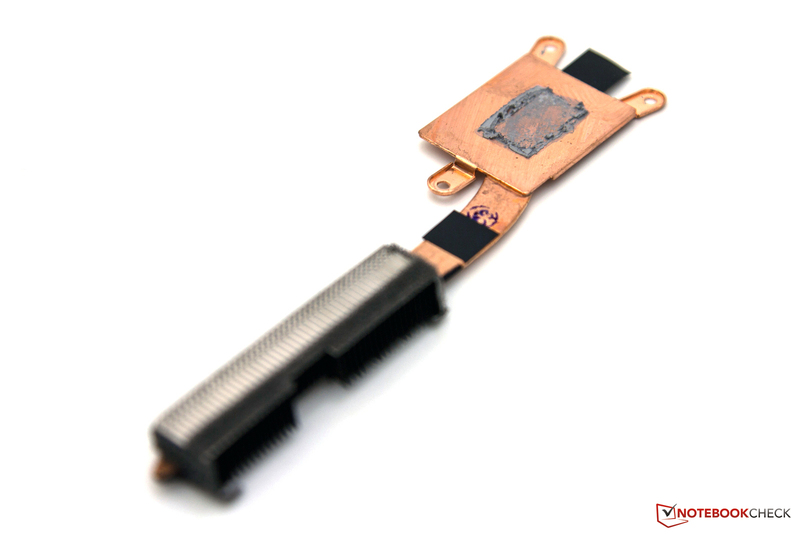 The ultrabook now features the Intel Centrino Advanced N 6235 Wi-Fi module which supports the 802.11a/b/g/n of the predecessor but replaces Bluetooth 3.0+HS with Bluetooth 4.0. 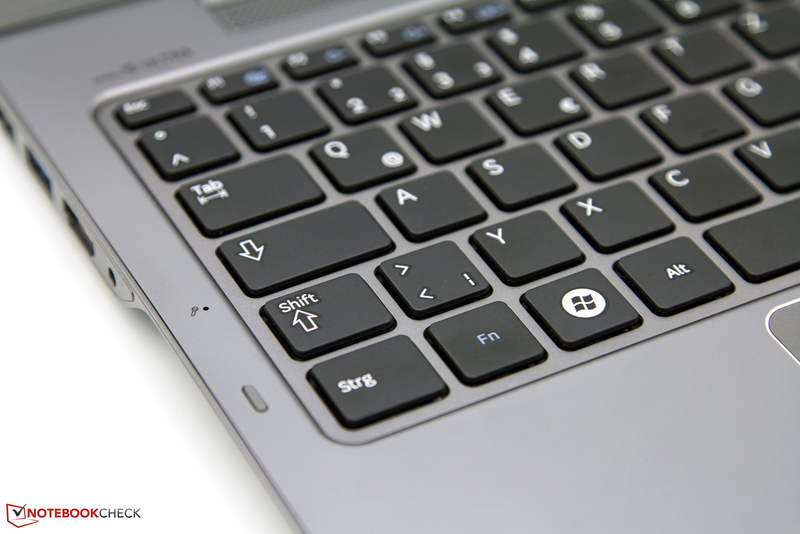 The Bluetooth 4.0 standard allows peripherals to communicate with the ultrabook at a higher communication speed while having an overall power saving effect. However, at this time, the number of peripherals that support Bluetooth 4.0 is still limited. As with the previous model, wired internet is provided by the Realtek Gigabit Ethernet controller and a Universal Mobile Telecommunications System (UMTS) module is still unavailable. Users seeking Internet on-the-go will need to turn to external options. The 530U3C-A01DE features a limited selection of included accessories. 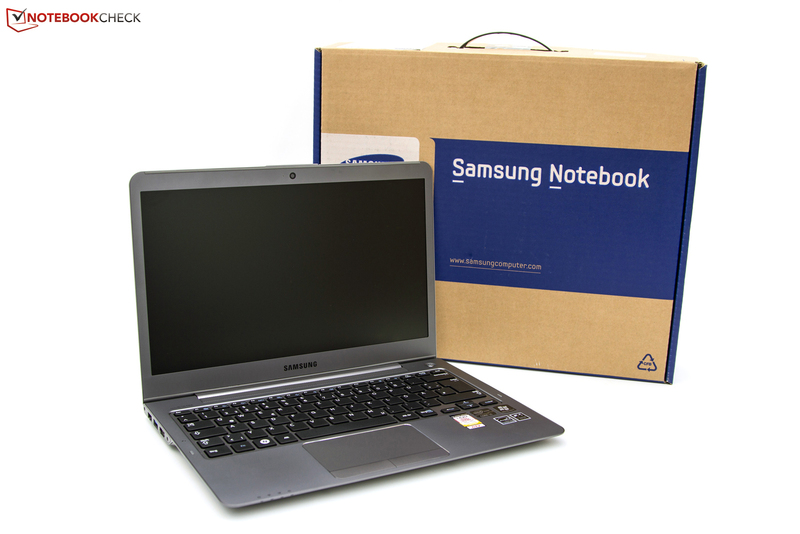 The retail package includes the ultrabook, a 40-Watt power supply, a few documents, and a recovery DVD. 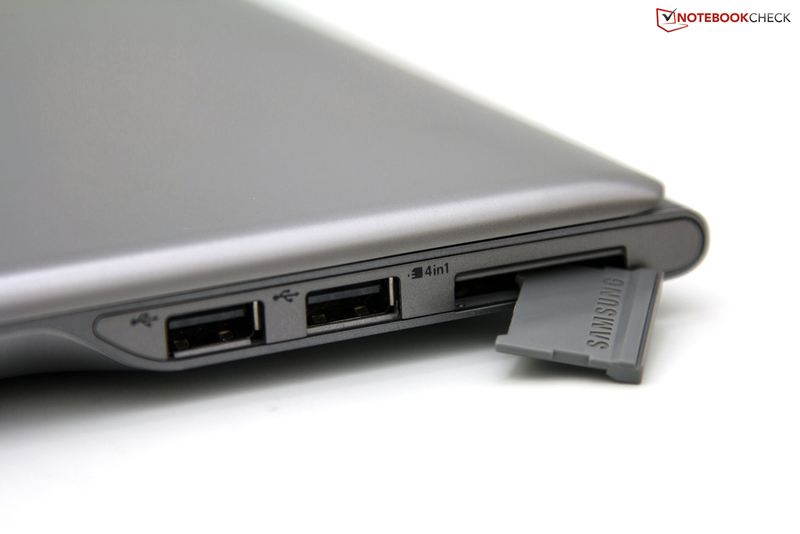 As the ultrabook lacks an optical drive, a USB flash drive would have been the preferred recovery medium. Additionally, Samsung chose to exclude the VGA adapter in this revision and external VGA support will require the user to buy this adapter separately at a price of approximately 40 Euro ($50 USD). 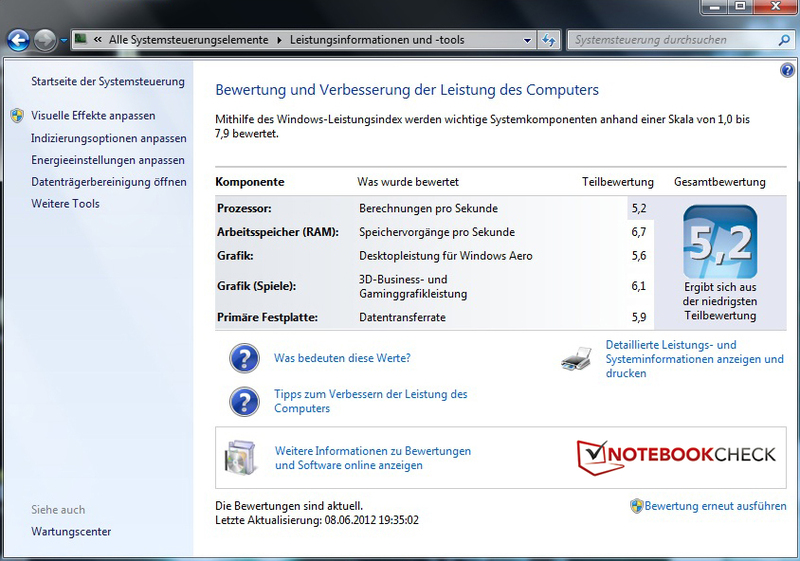 We found that the 530U3C-A01DE comes pre-installed with Windows 7 Home Premium (64-bit). Additionally, the ultrabook seems to feature bloatware such as the usual freeware, Microsoft Office 2010 Starter Edition, and a trial anti-virus program that we promptly removed due to numerous pop-ups. Most of these can be removed without a second thought. 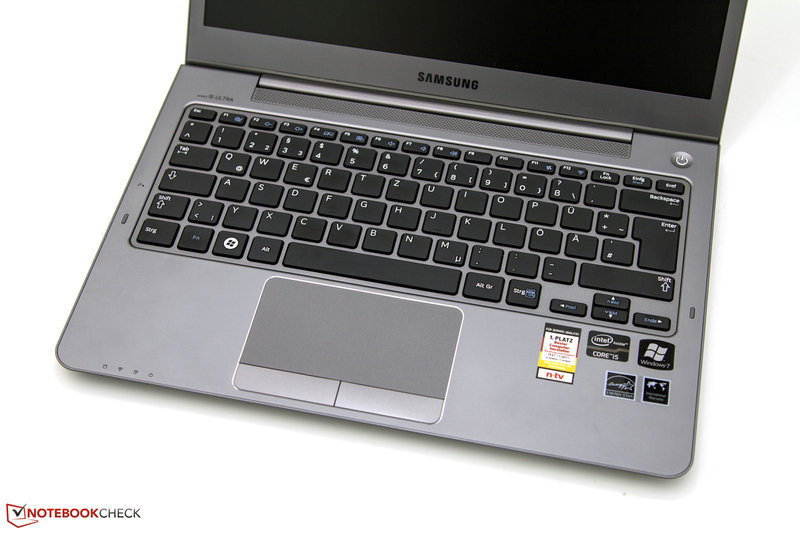 Samsung designed the 530U3C-A01DE to make maintenance surprisingly simple. 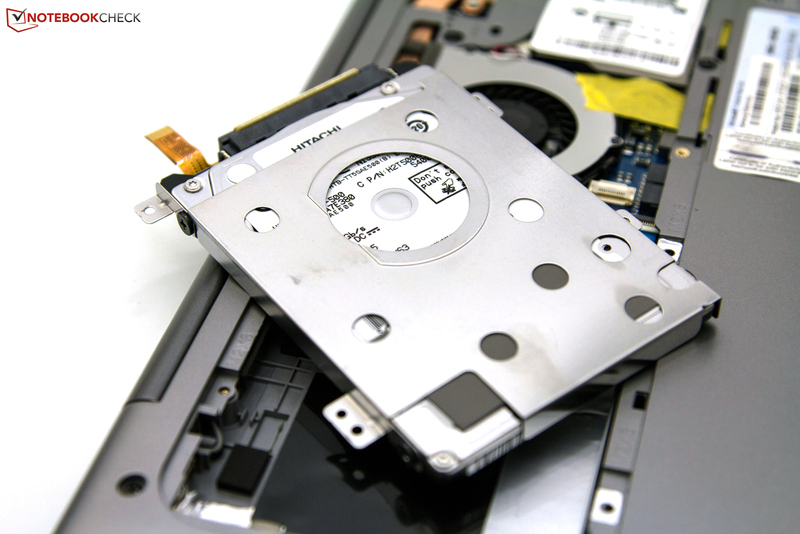 The maintenance cover is secured by one screw and removing it allows the user to access the 2.5-inch hard disk, RAM slot, and case fan. Cleaning the fan can be completed in a matter of minutes and does not require any special expertise or tools, save only a bit of caution. 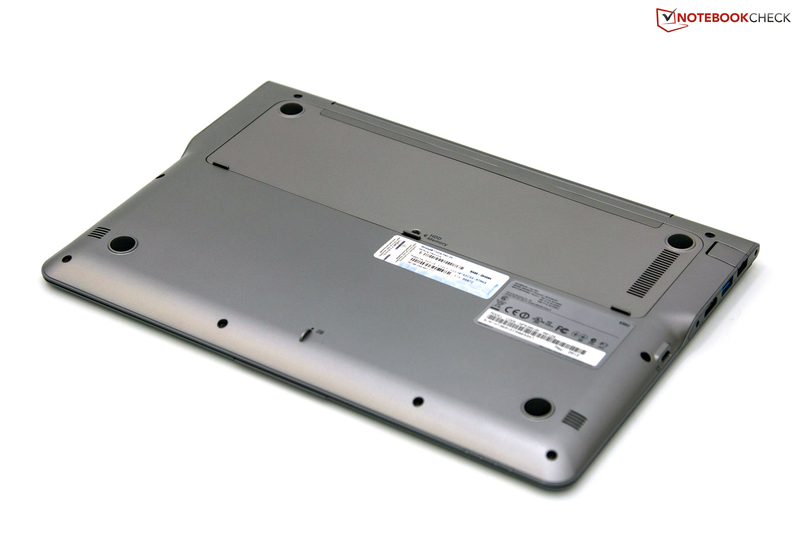 The battery is located beneath the wrist rest and can only be accessed if the entire base plate is removed. 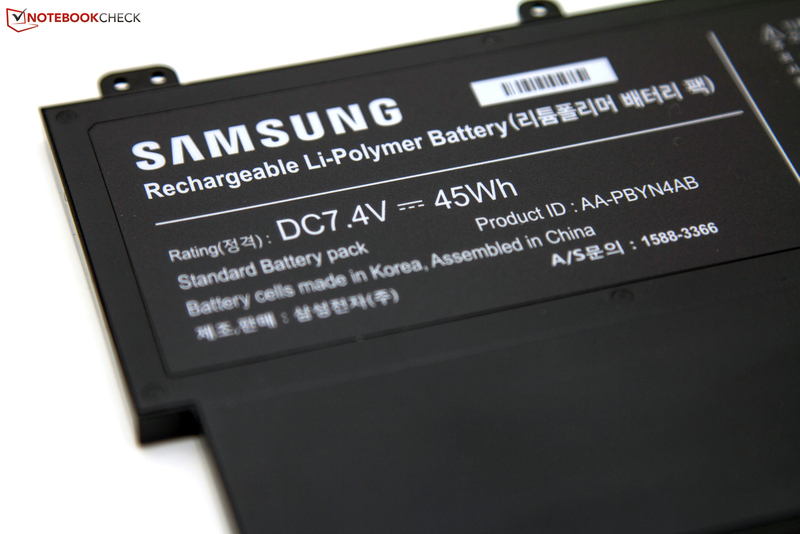 To put potential buyers at ease, Samsung guarantees 1500 charging cycles and a retained 70% capacity after three years. As is the case with other notebook families, the 530U3C-A01DE includes a 24-month warranty from Samsung. If necessary, this warranty can be extended to a total of 36 or 48 months but the extension must be purchased within 90 days of original device purchase. The prices for these extensions are not listed on the Samsung website. The 530U3C-A01DE features the same generously-sized chiclet keyboard and touchpad that were found in the Samsung Series 5 530U3B-A01DE ultrabook. 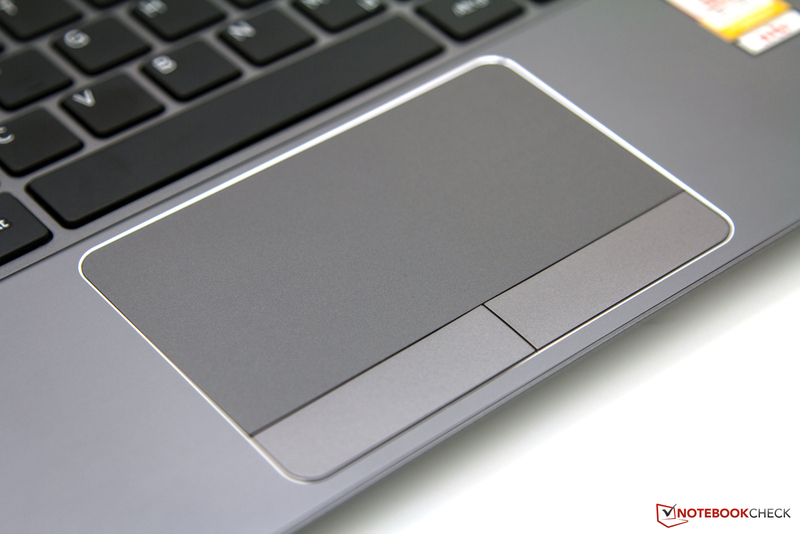 The touchpad continues to feature dedicated mouse buttons as opposed to the invisible mouse buttons that are popular amongst current notebooks. We would have appreciated this update to include an LED keyboard backlight. Chiclet-style keyboard has good feedback. Pleasant touchpad but the button clicks are too loud. The 530U3C-A01DE uses the same 13.3-inch Seiko Epson SEC0200 display that was used in the 530U3B-A01DE. The screen’s matte surface, 1366x768 resolution, and 16:9 aspect ratio have been maintained in this revision. 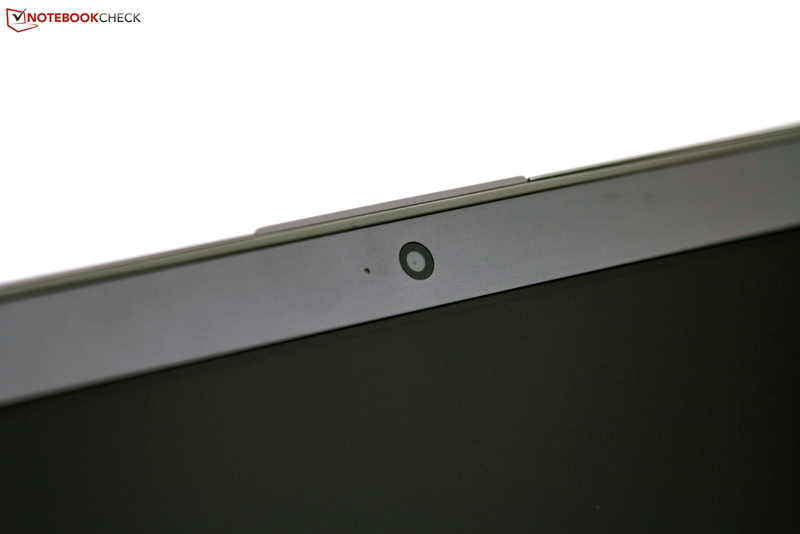 It should be mentioned that most ultrabooks use a glare-type screen with two notable exceptions – the Toshiba Satellite Z830 and the Asus Zenbook UX32VD. By comparison, Asus’s ultrabooks tend to feature significantly higher Full HD 1920x1080 resolutions in both their 11.6-inch and 13.3-inch displays. We sampled one such screen in our review of the Asus Zenbook UX32VD. We were able to use the 530U3C-A01DE to output these resolutions to external monitors and projectors via the built-in HDMI and VGA ports without problem. Using the Gossen Mavo Monitor, we measured slightly different rates than we did in the predecessor. In our test, we recorded a good average brightness of 307 cd/m2. We also measured a significantly more homogeneous illumination of 92 percent. The previous model struggled with brightness in the screen's right third. In contrast, the 2.47 cd/m2 black value and resulting contrast ratio of only 130:1 are not as satisfying. 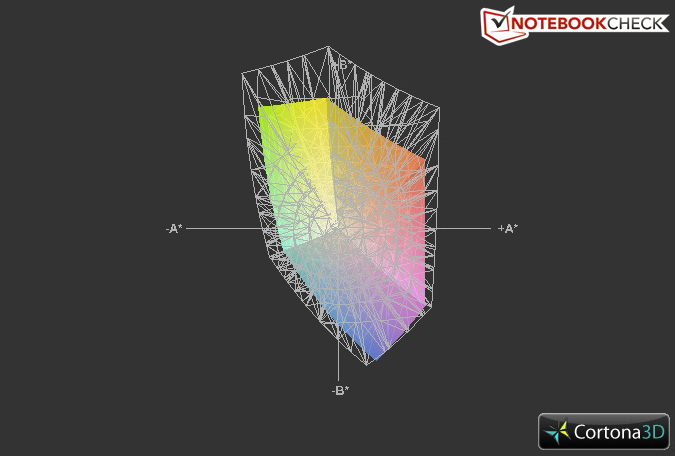 Subjectively, the screen produced colors that are not as brilliant as in the predecessor. 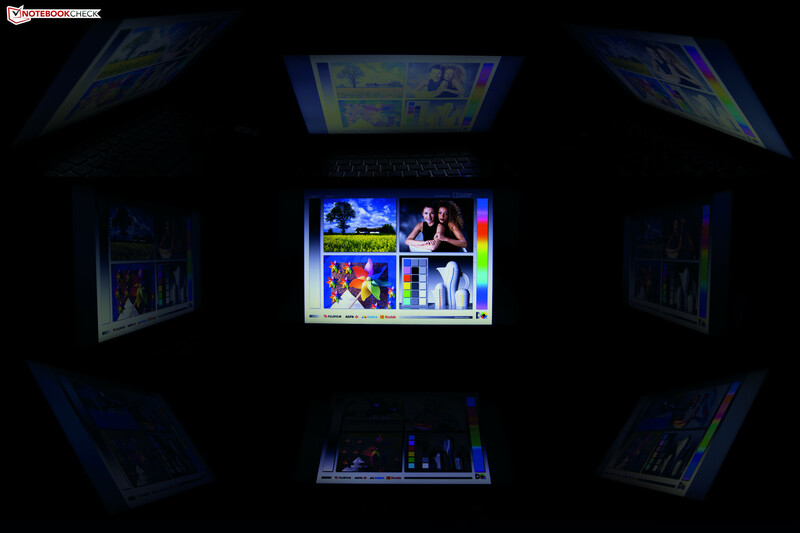 Professional photographers and graphic artists rely on a display’s reproducible color spectrum to produce high quality pictures. When compared to the predecessor and the Asus Zenbook UX32VD, the 530U3C-A01DE did not score very well. 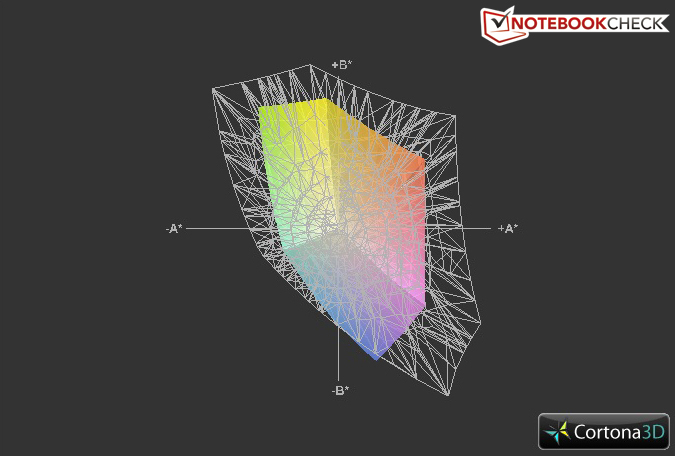 The display was well short of covering the typical reference color spectra and both the previous model and the Zenbook UX32VD provide better, albeit still imperfect, coverage of the above spectra. That said, it should be noted this device is targeted toward consumer use and is not designed to meet professional requirements. The combination of good brightness, matte surface, and homogenous illumination proved to be an advantage in outdoor use. The display was usable in shade, indirect light, and direct illumination from the rear. In our outdoor test, it was apparent that the display’s missing component is a high contrast. Nonetheless, the 530U3C-A01DE was impressive compared to the many ultrabooks that feature glare-type screens. 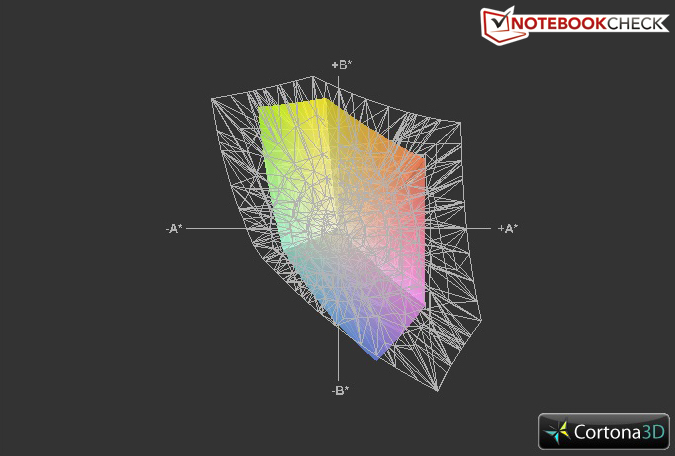 We found viewing able stability to be on par with typical budget twisted nematic (TN) screens. Horizontal viewing remained relatively stable although decreasing brightness at increasing angles was noticeable. Color inversion and fading were clearly observed after a deviation of only a few degrees in the vertical direction. The viewing angles are demonstrated in the following comparison image which clearly shows the effects of inversion and brightness loss when deviating from the ideal viewing position. The most notable difference between our test 530U3C-A01DE and the previous model is the 1.7 GHz Ivy Bridge ultra-low voltage Intel Core i5-3317U dual-core processor. Turbo Boost 2.0 technology allows the processor to dynamically overclock itself to a maximum single-core operating speed of 2.6 GHz. In contrast to the previous generation, the Ivy Bridge processor is fabricated on the 22 nm fabrication process and uses 3D transistors. These 3D transistors allow for more computational performance and efficiency depending on application. 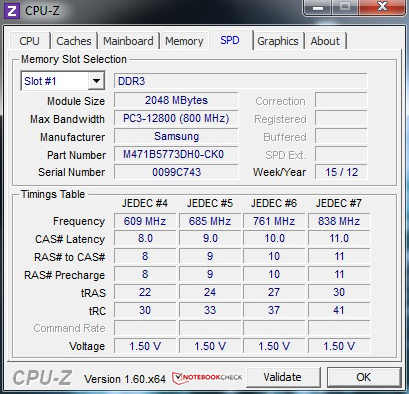 As a result of the new processor, the 530U3C-A01DE has changed from its predecessor to use DDR3-1600 RAM instead of the DDR3-1333 used previously. Our test device had a total of 6 GB memory consisting of 4 GB of integrated memory and 2 GB in a single memory slot. 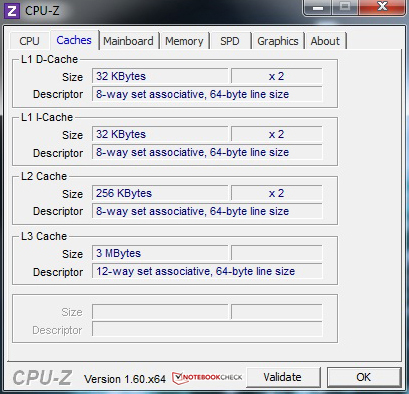 The CPU and memory are supported by a 500 GB 2.5-inch physical hard disk with a complementary 24 GB ExpressCache iSSD. Samsung chose not to install a dedicated graphics unit into the 530U3C-A01DE ultrabook and instead chose to make use of the processor-integrated Intel HD Graphics 4000. According to Intel, this GPU has a 60% higher performance than its preceding GMA HD Graphics 3000. At the launch of Ivy Bridge, we thoroughly tested both Ivy Bridge dual-core procesors and the Intel HD Graphics 4000. More information on these components can be found in the corresponding reviews. We began our processor test with the Maxon Cinebench suite. In the Cinebench R10 (64-bit) multiple CPU benchmark, the installed Intel Core i5-3317U scored 7991 points, putting it behind comparable configurations. 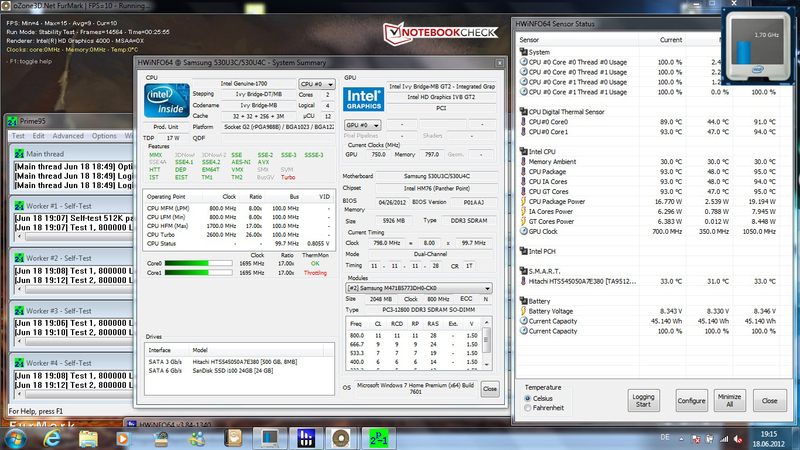 Its performance was 14 percent behind the Dell Vostro 3360 and 16 percent behind the Asus Zenbook UX32VD. 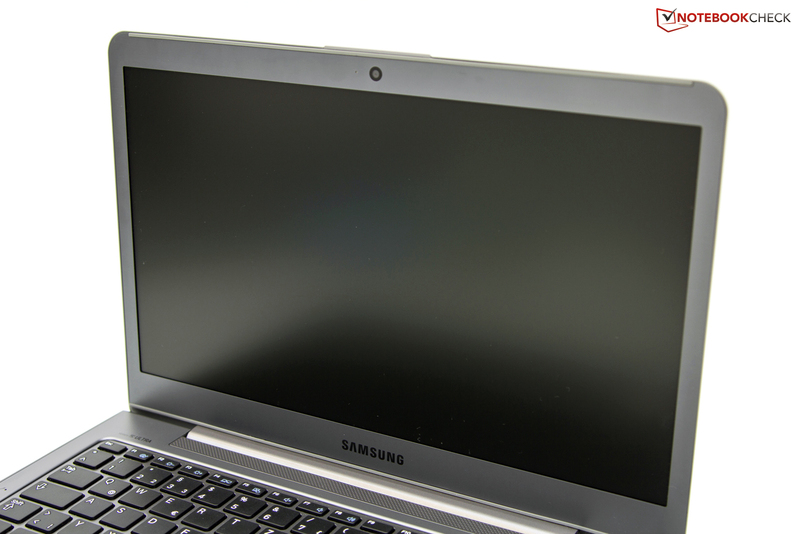 The previous generation Samsung Series 5 530U3B-A01DE remained 23 percent behind our test unit with 6138 points. The newer Cinebench R11.5 confirmed our previous results, showing the Dell Vostro to be 28 percent faster than our test device. In this test, the previous model was 16 percent slower than our sample. These poor results prompted us to take a closer look at the CPU’s Turbo Boost behavior during the Cinebench R11.5 tests. 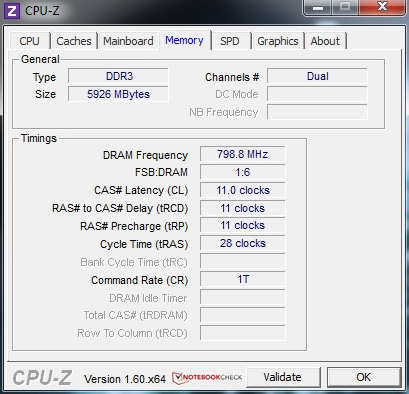 We observed that the processor clock dropped to the 1.7 GHz base clock, proving that Turbo Boost was not enabled. This might have been a consequence of the temperature issues mentioned in the Emissions section. We confirmed the absence of Turbo Boost under load using Cinebench R10. 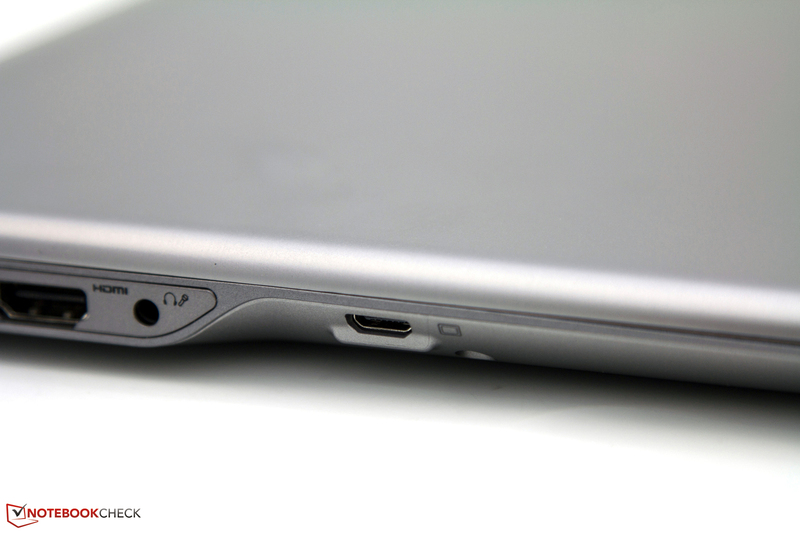 This absence puts the 530U3C-A01DE at a considerably disadvantage when compared to other ultrabooks. We tested the overall configuration using various system benchmarks. In PCMark 7, the 530U3C-A01DE achieved a fairly good 3272 points despite using a conventional hard disk. This result places the Series 5 in the middle of the pack in our benchmark database. The 40 percent performance gain over the preceding 530U3B-A01DE is impressive. 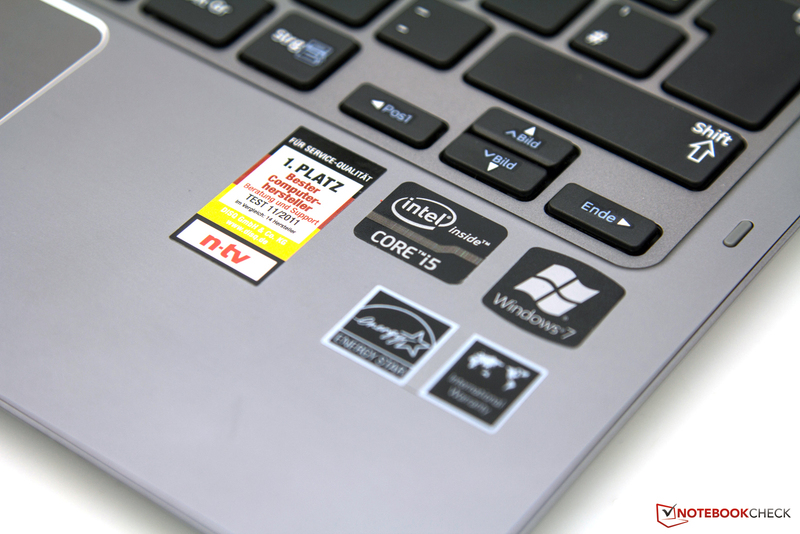 Surprisingly, the aforementioned Asus and Dell notebooks also scored lower than our test sample. It should be noted that all three comparison devices are equipped with only one hard drive. 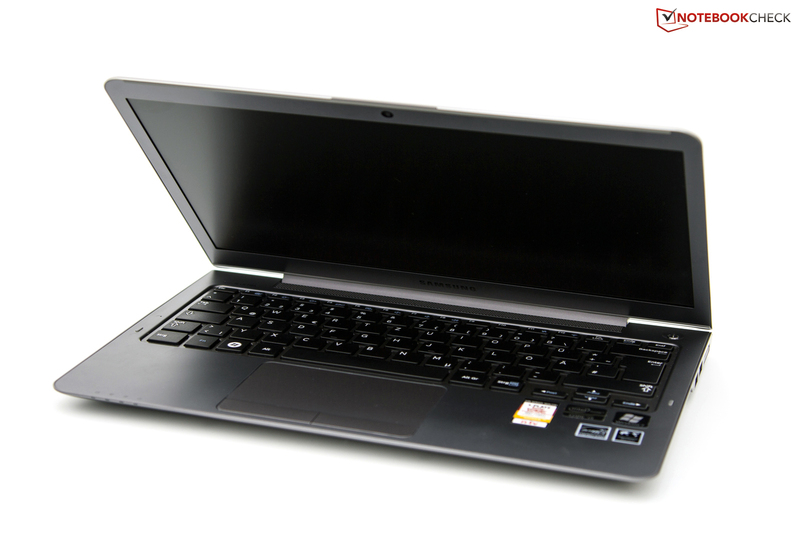 The 530U3C-A01DE uses a 5400 RPM 500 GB Hitachi 2.5-inch hard disk as its storage device. 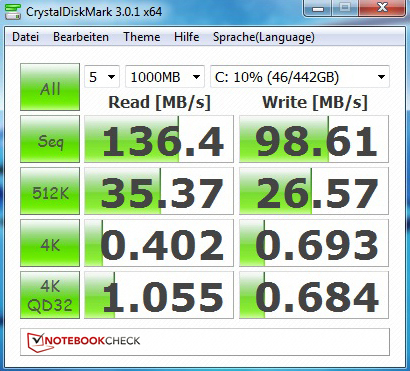 This drive is supported by a 24 GB ExpressCache SanDisk i100 iSSD which is built into the notebook to reduce boot times. The reduced Windows load time is highly noticeable in routine use. Nonetheless, this hybrid array cannot match the performance level of a pure solid state drive (SSD). The corresponding benchmarks confirm that the hard disk has a good transfer rate but the approximately 20 millisecond access times prove to be a bottleneck. In Futuremark’s synthetic 3D benchmarks, the CPU’s lack of Turbo Boost was inconsequential. For example, in 3DMark06, the ultrabook managed 4560 points overall. By comparison, the Asus Zenbook UX32VD was 6 percent ahead when limited to the Intel GMA HD 4000 GPU and the previous generation 530U3B-A01DE fell behind by 33 percent. 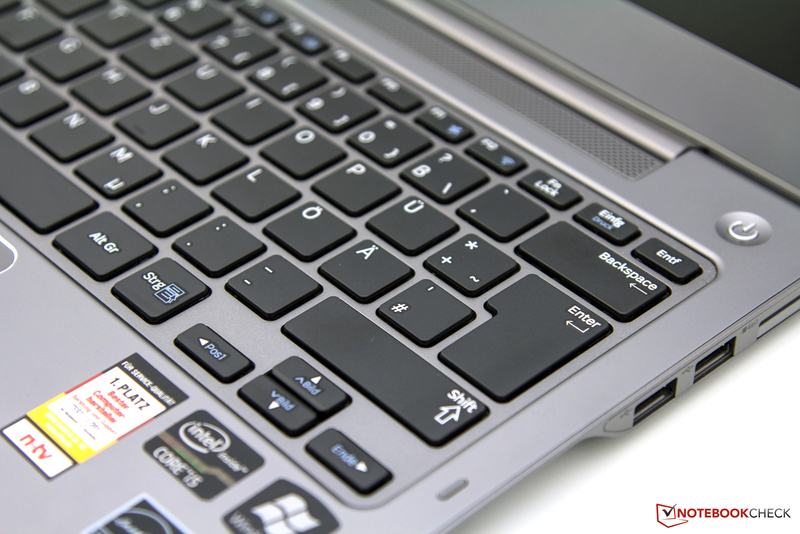 Once we enabled the GeForce GT 620M in the UX32VD, the Asus ultrabook jumped ahead by 64 percent. 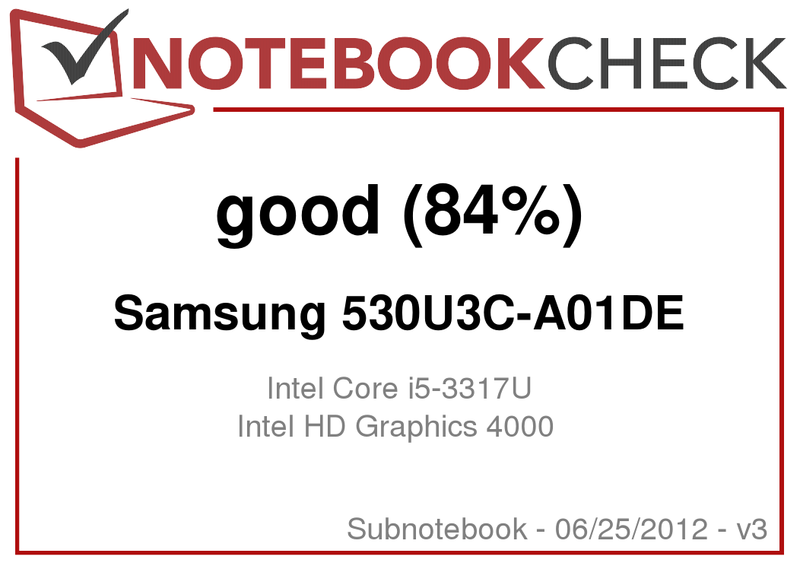 From these benchmarks, it is safe to conclude that the Samsung 530U3C-A01DE supplies sufficient performance for most multimedia applications. However, complicated image and video editing should be avoided. It goes without saying that the Intel HD Graphics 4000 does not transform ultrabooks into gaming machines. We tested four popular games in our test and determined the 530U3C-A01DE’s achievable frame rates. We found that many games ran smoothly using minimum settings but that the system became quite limited in higher settings. Moreover, we found the games to be considerably less fun at the required resolutions of 800x600 and 1024x768. Even causal gamers should look for a device with a dedicated graphics card. 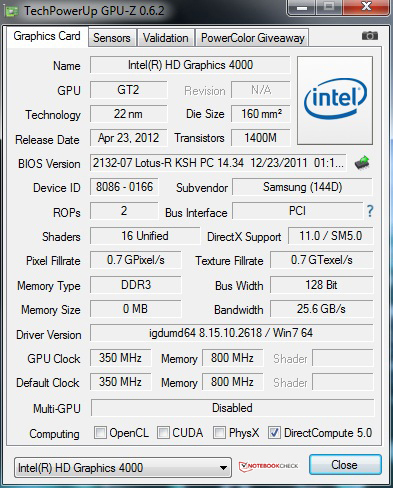 For example, the Asus Zenbook UX32VD offers the Nvidia GeForce GT 620M and correspondingly better performance rates. The 530U3C-A01DE’s 2.5-inch hard disk is an unassuming noisemaker. In light of this and the case’s small fan, it would appear that Samsung has changed nothing from the 530U3B-A01DE and noise fluctuations in most scenarios were minor. 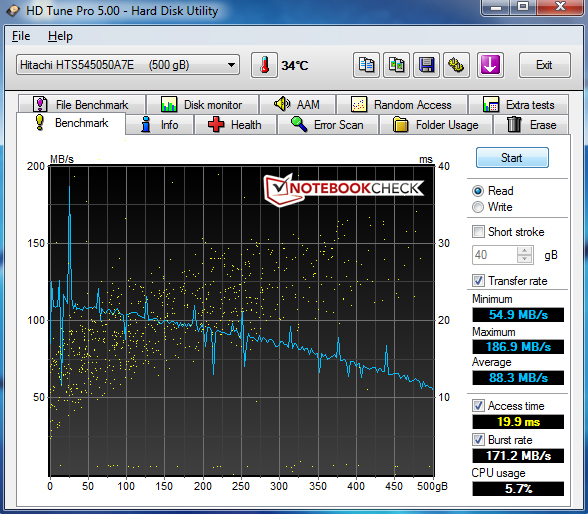 The ultrabook unobtrustively blended into the general background with a maximum noise of 31.4 dB(A) while idle. 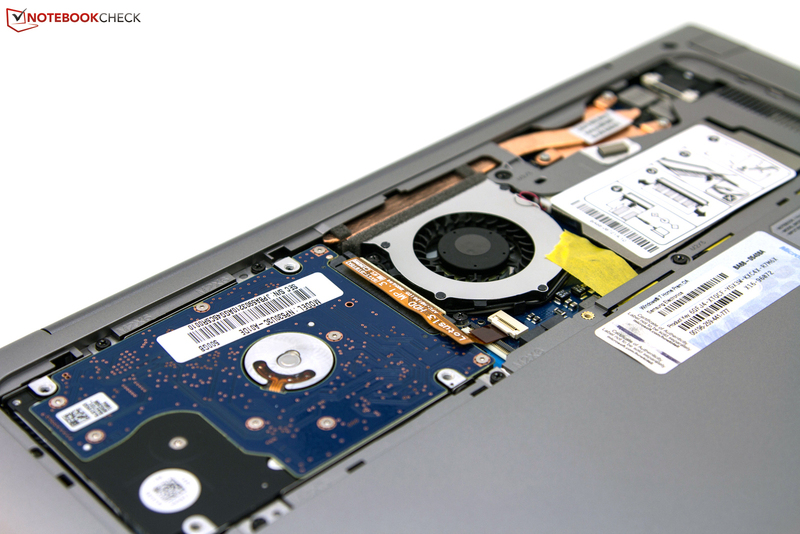 While largely not prevalent, the noise of the hard disk could be eliminated with a modern SSD. During our Prime95 and Furmark stress test, the fan increased in speed and generated a maximum noise of 37.6 db(A). Subjectively, this is an audible, but hardly disturbing noise level. While our 530U3C-A01DE was idle, we measured temperatures between 27.2 and 40.2 degrees Celsius (81.0 and 104.4 degrees Fahrenheit). These temperatures are on average higher than those of the previous model 530U3B with an average difference of between three and four degrees Celsius (five to seven degrees Fahrenheit). This difference while idle is quite significant considering that the only changes to the model from the previous model are the CPU and its chipset. We particularly disliked the peak temperature of over 40 degrees Celsius (104 degrees Fahrenheit) in this situation. The previous model reached a maximum of 33.2 degrees Celsius (91.8 degrees Fahrenheit) while idle. During load, the fan became noticeably more audible and the case became noticeably warm to the touch on the top and bottom with a maximum temperature of 51.6 degrees Celsius (124.9 degrees Fahrenheit). While this heat was particularly noticeable and unfavorable in the area above the keyboard, the ergonomically important wrist rest remained within an acceptable temperature range. The keys were also noticeably warmer. 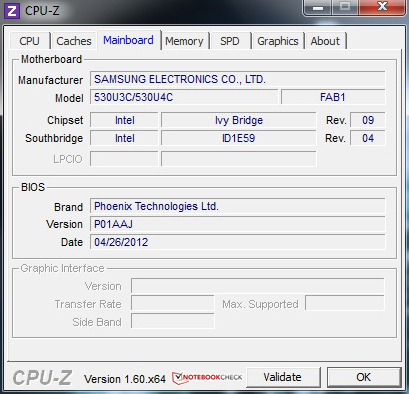 Overall, the Ivy Bridge implementation was surpassed by the older Sandy Bridge configuration. These results prompted us to assess the individual component temperatures during our stress test. The combination of Prime95 and Furmark pushed the system’s components to their limits and quickly illustrated some potential problems. The CPU reached a temperature of over 90 degrees Celsius (194 degrees Fahrenheit) after a short time and HWiNFO recorded momentary throttling of core 2. We found this interesting as the clock frequency was never reduced. As we recorded in our test, Turbo Boost 2.0 was not available during load. This reflects the performance loss under high, short-term load that we observed during our Cinebench CPU tests. We conducted a second stress test using 3DMark11 after the ultrabook had reached temperatures consistent with a cold start. In this test, we did not observe throttling due to overheating. The audio system consists of two speakers located beneath the wrist rest’s right and left sides. The speakers have a rated power output of two Watts each. We found the sound unusually unbalanced. High pitches were rendered clearly but bass and deep pitches were largely absent. We would recommend the use of external speakers or headphones for any tasks that goes beyond simple Skype calls. These can be connected via the audio port or HDMI out, depending on the peripheral of choice. For all portable devices, power consumption is the most important influence on battery life when off AC power. While idle, we observed a power consumption between 7.2 and 11.8 Watts. This makes the 530U3C-A01DE a bit more energy-efficient than its Sandy Bridge predecessor. Under load, consumption increased and peaked at 39 Watts making the 530U3C-A01DE more power hungry under load than the previous model. The average consumption is nonetheless on par and comparable with similar devices from other manufacturers. As with the previous model, the 530U3C-A01DE features a built-in four-cell lithium polymer battery with a designed capacity of 45 Wh. 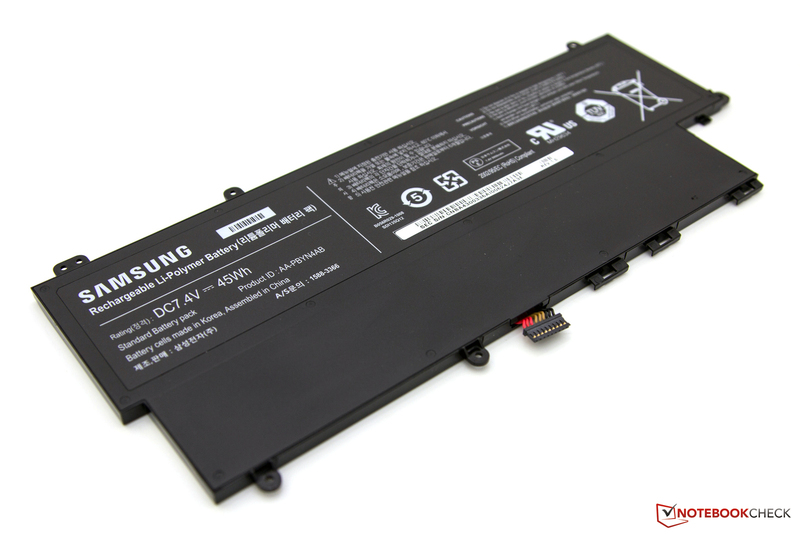 Samsung guarantees this battery will last up to 1500 charging cycles. The notebook comes with a 40 Watt power supply. In light of the device’s compact size, we would have appreciated a single-cable power supply as is included in the premium Series 9 family of notebooks. To test battery runtimes, we used the BatteryEater test suite and constructed three scenarios. In the first scenario, we attempted to determine minimum battery life by enabling all mobile technologies, using the high-performance profile, and using maximum screen brightness. We disabled the integrated ambient light sensor to disable adaptive brightness for these measurements. We then used the Classic Test to load the system’s components. In this scenario, we measured a runtime of 2 hours and 12 minutes. In the second scenario, we used the Reader Test to simulate basic office and productivity tasks. The display was set to minimum brightness, energy-saving options were enabled, and mobile technologies were disabled in this test. We observed a runtime of approximately 9 hours in office use, an increase of over an hour compared to the preceding model. In the third scenario, we used the “Surfing via Wi-Fi” configuration. 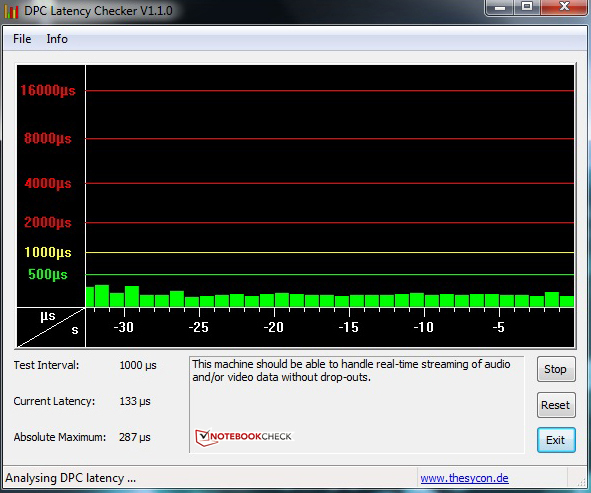 We adjusted the brightness to approximately 150 cd/m2 and enabled the Wi-Fi adapter. In this scenario, we measured a runtime of five hours. We found this runtime to be acceptable but also noted that the previous model was able to run for 6 hours and 26 minutes under the same conditions. Overall, we found the runtimes to be good and consistent with the expectations of a slim ultrabook lacking a large, high-capacity battery. Nonetheless, the shorter runtimes when compared to the previous model, especially in practical Wi-Fi use, are displeasing. 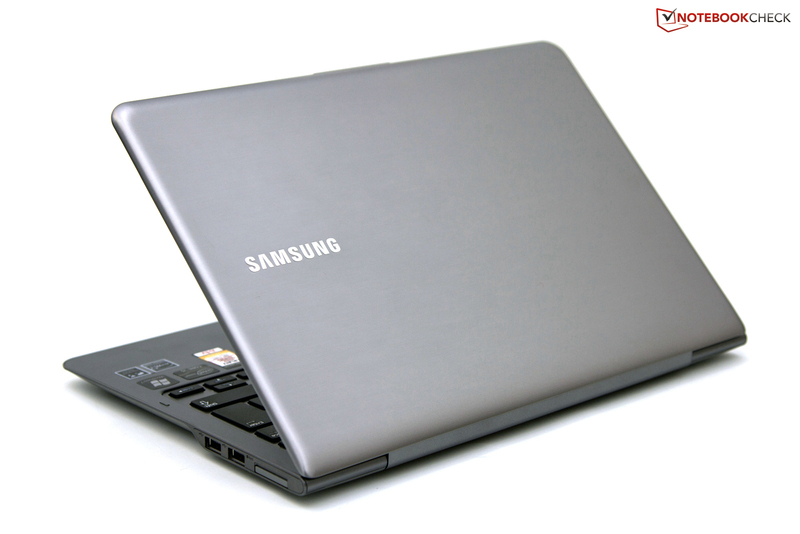 The Samsung Series 5 530U3C-A01DE ultrabook follows in the footsteps of the previous model which implemented many good features. The plain case and matte screen were inherited without modification. While the latter was convincing in terms of brightness and illumination, contrast remained weak. The Intel’s Core i5-3317U dual-core processor showed impressive performance in our tests when compared with the previous model’s Sandy Bridge equivalent but the obvious lack of Turbo Boost during load reduced this unit’s potential power. 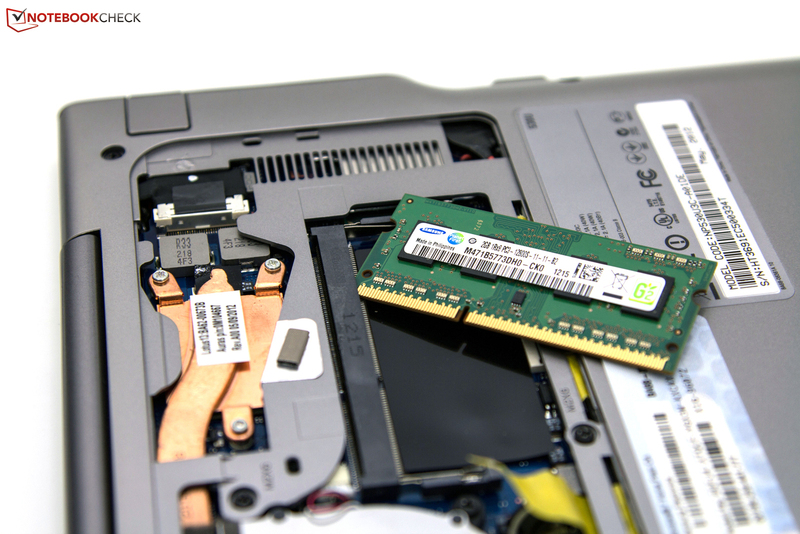 Other manufacturers often rely on considerably more expensive SSD drives in the mSATA form factor as the storage device for their ultrabooks. To avoid this price increase, Samsung combined a 24 GB ExpressCache iSSD and 500 GB physical hard disk to serve as the storage device, resulting in an MSRP of 799 Euro ($999 USD). While beneficial to the price, this hybrid solution cannot compete with pure SSD devices in terms of performance. Samsung also managed to reduce costs somewhat by reducing the complement of included accessories. The proprietary VGA adapter that was formerly included is now sold separately at a cost of approximately 40 Euro ($50 USD). Last but not least, we found the design allows for easy maintenance and we praise Samsung for this. The internal fan can be cleaned quickly and easily and even the hard drive can be replaced with a fast SSD without expertise. The final question remains. Is it worth switching? For owners of the previous generation 530U3B-A01DE, the answer is a resounding no. However, for those currently looking for an affordable, slim consumer device with a matte screen, this device from Samsung is certainly a reasonable option. 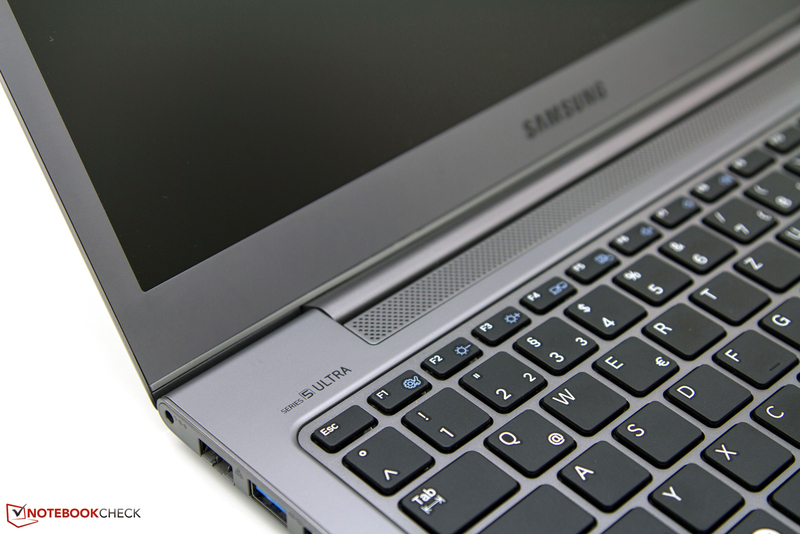 We tested the updated Samsung Series 5 ultrabook. Matte screen with good brightness. Contrast is too low. 1.3 megapixels are suitable for low-quality video calls. The case fan under the maintenance hatch is pleasing. The 500 GB HDD is supported by a 24 GB ExpressCache. 4 GB on board RAM abd 2 GB (DDR3) in slot. 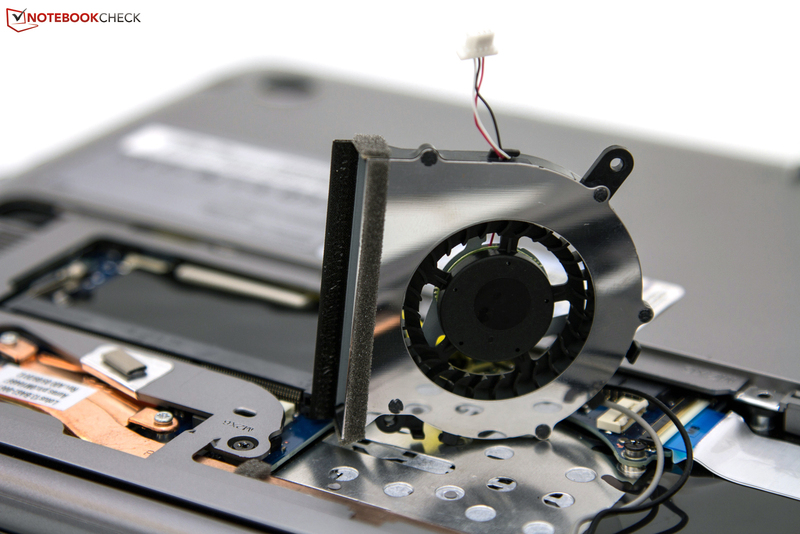 Removing the base plate allows access to the built-in battery. 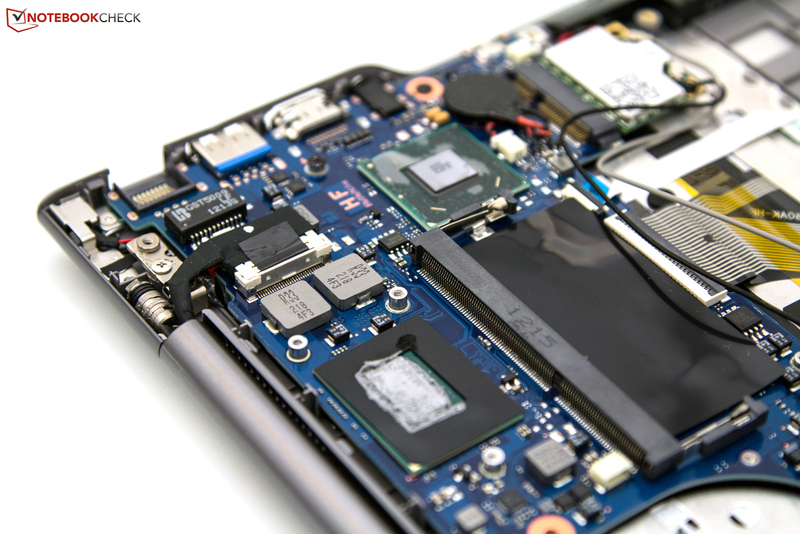 The ultrabook’s internal components around the Ivy Bridge processor. A lithium polymer battery allows for mobile operation. Rated battery capacity is 47 Wh over 4 cells. The display hinge provides a tight grip, but teeters. The crisp pressure point and good feedback are pleasing. The chiclet-style keyboard has a generous layout. The previous case not modified in this revision. The aluminum and fiber glass combination feels good. Stability and rigidity are unchanged and could be better. The bottom only has one small maintenance cover. 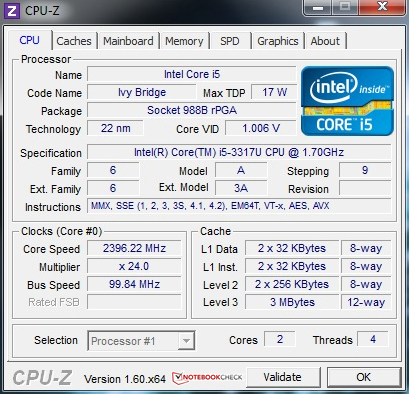 Intel Inside: Ivy Bridge Core i5-3317U CPU. Connectivity is unchanged. USB 3.0 & HDMI on the left. VGA Out via adapter. The adapter is not included with purchase. Right Side: two more USB ports (USB 2.0) and a 4-in-1 card reader. Four status LEDs on the front. No interfaces. 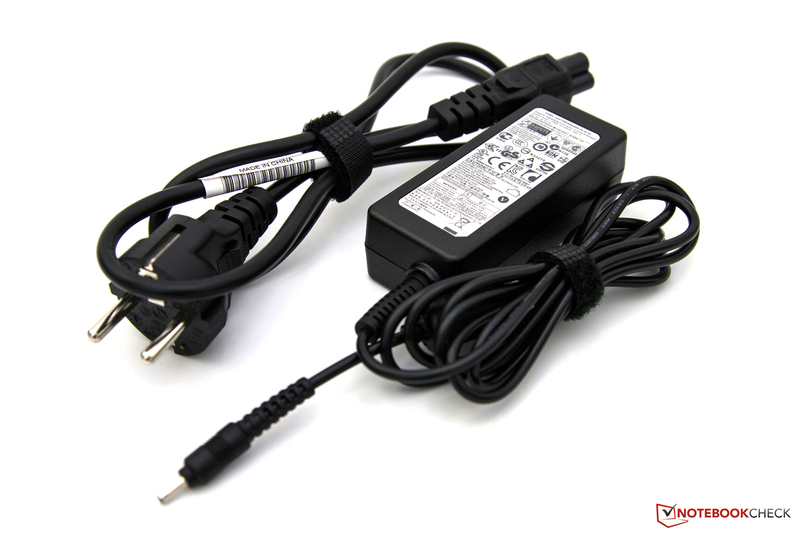 A compact 40-Watt adapter is included. 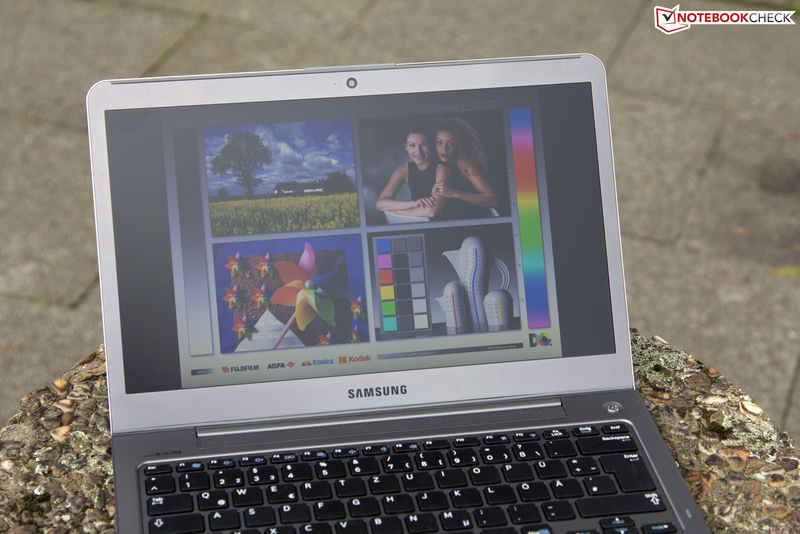 The increased application and graphics performance, the matte screen and the ultrabook’s seemingly timeless design. A better contrast and Turbo Boost of the installed ULV CPU or a more efficient cooling management that can cope with the components’ performance and waste heat. 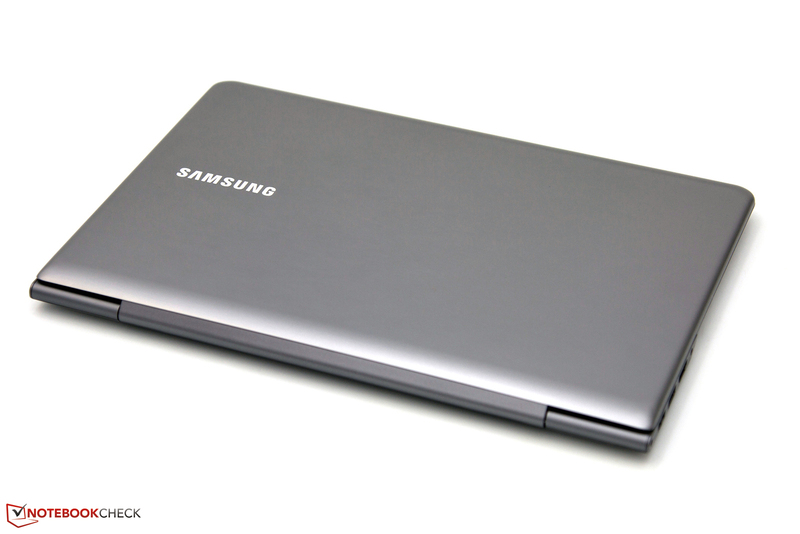 That Samsung still equips the ultrabook with a conventional hard disk. However, it has a positive impact on the starting price. Various ultrabooks with a 13.3 inch screen and Intel’s new processors that are sent into the second round. Among others, Toshiba’s Portégé Z930 and Satellite Z930 ultrabooks, Asus’ Zenbook UX31A featuring a Full HD screen or Acer’s Aspire S3 that is also available for starting at EUR 800.